Hi, my name is Jeff Bowman. I am a creative/art director and graphic designer. Presently freelancing as Bowman Creative. My life is in a state of constant change, which doesn’t always feel so great once you go past the age of 40 and are in the “youth-oriented” ad business. 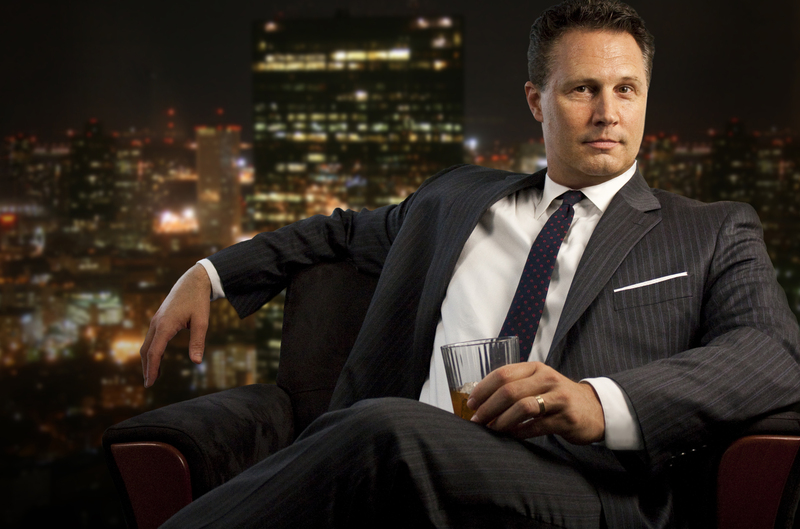 I started this blog 2 weeks after entering the “Mad Men Casting Call” contest and as part of a class assignment in a WordPress blog and website design class taught by Martin Brossman and Andrew Hill at Wake Tech Community College, near my home in the Raleigh, NC area. Bouncing off some of the profound lessons in human nature found on “Mad Men,” I want this to be a forum about change, in the ad business, in the society, and in all of our (m)ad lives these days. Here’s my story of The Tipping Point that lead me to begin this CHANGE conversation. 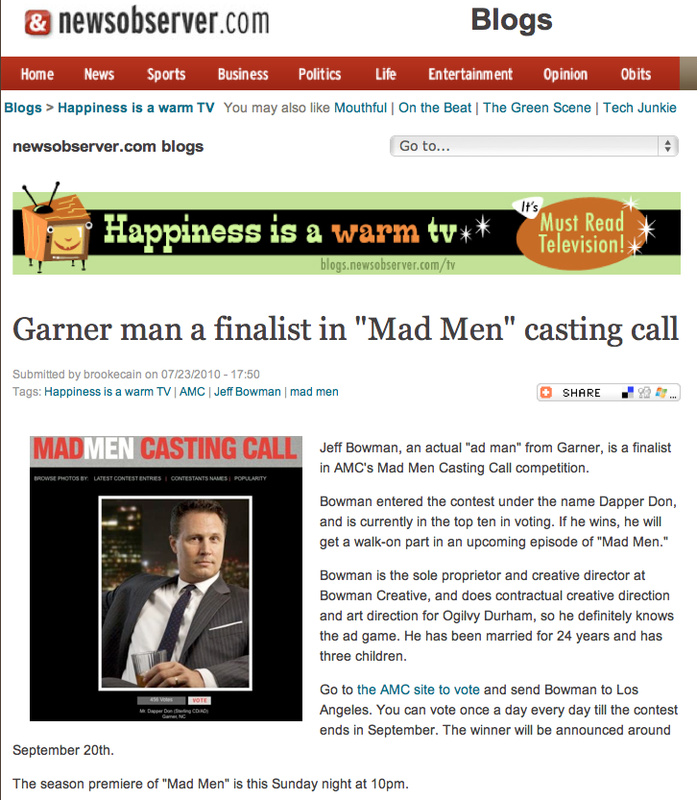 One day in mid-July, 2010, a Tweet shows up about a contest called the “Mad Men Casting Call.” The prize is a chance to win a walk-on role on an episode of this AMC TV show, 4 days in LA, and 15-minutes of fame. Lastly, some free, high-styling clothes at Banana Republic. When I heard about the contest, I was in the middle of one of the worse summers in my career, trying to find projects and/or jobs. Holding out for some projects on hold till Fall so I could return to the land of making income once again. So, why interrupt my very aggressive job networking and project search efforts to enter the contest? Simply, I already had a very good picture. In the Fall of 2009, it was photographed for me as a personal bio picture by my good friends, Matt Herring and Jim Kennedy. This was right before the ad agency we all worked for, The Catevo Group, closed on Nov., Friday the 13th, 2o09. Being a fan of the show, I also sorta’ do what they do on the show. Although, what I do doesn’t fit perfectly into any of the 1960’s job descriptions (one of many industry changes), my job is more similar to the character, Salvatore Romano (Bryan Batt), head of the art department and sometimes somewhat like what Don Draper’s (John Hamm), creative director/copywriter). As I planned the photo, I was thinking more of replicating the energy, attitude of the iconic Don Draper (Thus, the name “Mr. Dapper Don” on my entry). On July 23rd ( a day late), I was just crazy enough to enter, having no idea if I could win or how to win anything like this, and without any plan for success. Entering required a code from a Banana Republic retail store (it is a “promotion” after all, thought up by ad and PR people, ultimately to make you think of Banana Republic when you think of the distinctive “Mad Men” early 60’s style, plus buy a few clothes with their special discount coupon). But after getting the code, it just required uploading the picture. Little did I know how this would take over my life, transform my ideas of social media, and change all my project/job searches and prospects to the positive. Up until that time, social media for me was mostly about, well, just being social. Frankly, I feel it should really stay that way (but that’s a topic for a later post). However, since that date I have learned a lot about social media; the limits, the power, and the possibilities. More importantly, I’ve learned about the powerful importance of the support of my friends and family. Then, as an extension to them, my network of work associates and friendly acquaintances. It’s quickly become a testament to the power of social networking, as well as, a training ground for a lot of social, social media and life lessons. In the first few hours, it was FaceBooked, Tweeted and LinkedIn. I sent email to contacts, friends, work colleagues and neighbors. The numbers slowly grew over the next few hours. Then, the big surprise that changed everything for me. 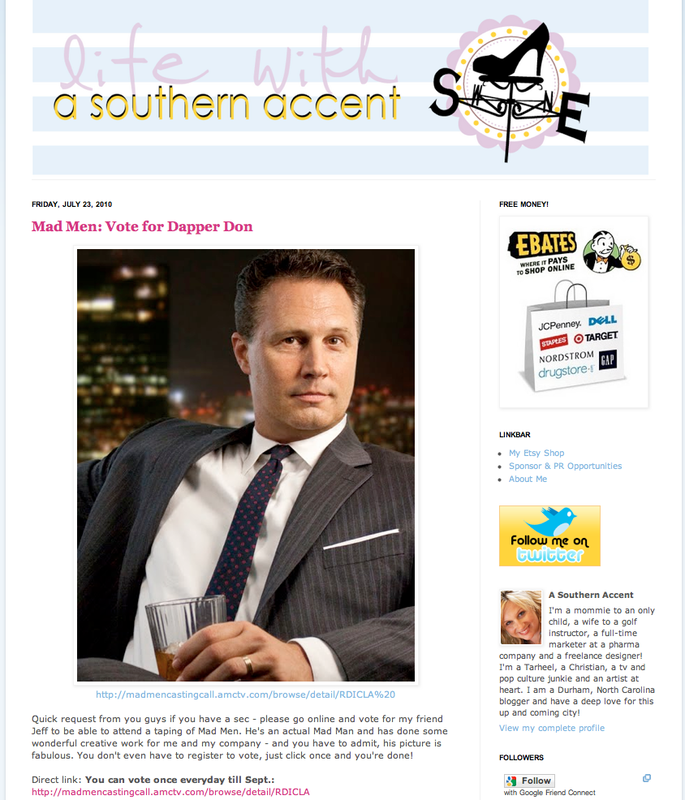 One of client kindly posted the contest and appeal for votes on her blog, A Southern Accent. I went from zero to over 400 votes in the first 20 hours using only my social media outlets and my networks. By the end of 48 hours, I had 1000 votes and was in 4th place! I never dreamed it was possible, and was astonished, encouraged, humbled and blessed by everyone’s support. Once I was on the first page, and in the Top Ten, Brooke Cain with the New & Observer picked it up on their TV blog, tweeted it and posted it on their FaceBook page. Shortly following, WRAL, local CBS affiliate, producer, Stacie Holyfield tweeted it. As well, The Garner Citizen, my home town outside of Raleigh, NC, picked up the story and supported me. The journey of us (m)ad making change in the world has just begun, and the competition was just one milepost along the way. The lessons are being learned each day, and hopefully this FORUM of CHANGE will remain, with many of you contributing. Thanks so much for your support. Especially thanks to my friends and family, the local RDU community, Madison-Mayodan HighSchool buddies (see, I was born a “Mad” man from Madison, NC), the Ad/Design community locally and nationally (esp. AIGA), and my old community theatre community.